The evolution of cookware has taken us from turtle shells, clay cooking baskets, earthenware pottery and Celtic myths of magical cauldrons...to real cauldrons, spits, (common in medieval kitchens) and onto the metal and nonmetal cookware of today. Today’s cookware for the stovetop (with the exception of Corningware, a favorite of mine, made from glass ceramic) is made primarily from metals: cast iron, aluminum, steel, copper and stainless steel. Both cast iron and carbon steel cookware must be seasoned before using (see below link for how to season a Wok). Once seasoned, over time the cookware lining will get increasingly darker and serve as a nonstick surface. Carbon steel and cast Iron are the most common for Woks. And unlike what you may be thinking about the cast iron -- cast Iron Woks made in China are surprisingly not heavier than steel Woks. Carbon steel seems to be the most popular among Asian cooks and is our personal favorite too. Similar to cast iron, carbon steel is reactive to acidic foods, therefore is not a good choice for cooking with wine, citrus juice or tomatoes. Carbon steel is steel derived from Metallic Iron and is a combination of Iron with a small amount of Carbon. The metallic form of iron (Fe) is not found in nature and must be derived from iron ore. Although Carbon steel does not conduct heat as well as other metals, it can be rolled and hammered into very thin, strong sheets with high heat resistance. This is an advantage in Wok cooking. Wok Stir-fry cooking is a healthy cooking method because the high bottom heat quickly sears in the water soluble nutrients in the food. Also over cooking can be avoided by moving the food up the sides of the Wok where there is less heat, controlling the cooking. Types of Woks come in various styles, primarily: Cantonese (round bottomed with two metal handles), Northern-Style (a long, hollow metal handle and round bottom), and Shanghainese (like the Cantonese with two metal handles, but with a slightly rounder and deeper), and a flat-bottomed Wok (with two wooden handles) created specifically for use on residential electric ranges. We prefer the Northern-Style, round bottom with a long single handle and find it is best for cooking on our gas cooktop. We have two well used and seasoned Woks, one large 16-inch and one average size 14-inch. Both are good sizes for home use. 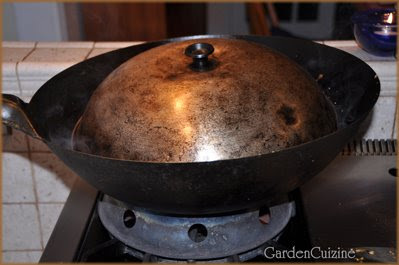 We often use the lid from the smaller wok to cover food when we cook in the larger wok (as shown in the photo). Also, we always use a circular metal ring “collar” as the base over the gas burner to raise up the wok and avoid damage to the heat element. The collar makes a nice, stable stand for the Wok too. Collars were introduced to Western world markets as an innovative accompaniment to the Wok in the1960’s. Many foods lend themselves to wok cookery, especially vegetables and proteins such as poultry, meats or tofu. 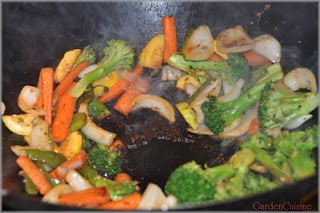 Stir-fries are the most common use, but woks can also be used for many other cooking methods, such as braising, deep-frying, boiling, and steaming. Woks have been used for cooking around the world and in Chinese cooking for more than 2000 years, mainly because of their versatility and ability to cook large quantities of food quickly at high temperatures, using little fuel expenditure. In the late 1970’s -- woks -- a once culinary staple cookware, started being replaced with modern cookware of the times influenced by Western society. Sensing this change in Chinese cuisine and culture, Grace Young and photographer Alan Richardson collected woks across the United States and China. Their work resulted in a fall exhibit in 2004 at New York University’s Asian/Pacific/American Institute, New York, NY called, the “Wok Hay” exhibit. The exhibit showcased Woks collected from the US and China by Young and Richardson. Their collaboration also resulted in a book, The Breath of a Wok: Unlocking the Spirit of Chinese Wok Cooking through Recipes and Lore (Simon & Schuster). Some regions refer to woks or similar cookware by different names. ‘Karahi’ is the name for similar cookware in India, ‘Penggorengan’ in Indonesia, ‘Kuali’ or ‘Kawa’ (small or large wok) in Malaysia, and in Japan, woks are called Chinese pots ‘Chukanabe’.